On December 20 we woke to blue skies – the first really blue skies we had seen since leaving home in Texas. We saw that the Explorer had dropped anchor off Gourdin Island near the tip of the Antarctic Peninsula. Gourdin, as Expedition Leader Brad explained, was a major site for penguin rookeries, in fact sheltering all three species of “brush-tailed penguins.” We had been instructed in proper behavior for Antarctic tourists – stay five meters from the nests, give penguins the right of way, never, never touch a bird, and avoid any behavior that seems to be making them excited. We cheerfully pulled on our waterproof boots, pants and parkas and boarded our zodiacs, but as we came ashore we saw that it was not going to be easy to follow all the rules. We had landed in the midst of a penguin seaside resort. Crowds of penguins were watching our boats come in, some coming down for a closer look. Whole cues of penguins were lining up to at favorite dive spots, waiting for their turn to plunge into the water, while armadas of penguins were splashing back to shore. 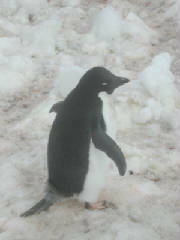 We learned to distinguish the plain black and white Adelie penguins that predominated from their relatives, the red-billed gentoos and the chinstraps, which sported a black band like a chinstrap or a painted grin, giving them a clown-like appearance. Penguin mothers were nesting in dense rookeries, their accumulated excrement giving off an unforgettable penguin smell. Just following the slippery penguin trail up from the beach brought us close to the penguins, who chose to make their nests on rocky ledges next to the trail. We tried to move quickly and not disturb, but the photo opportunities were irresistible, especially as we saw penguin chicks peeking from beneath their mothers’ bosoms. 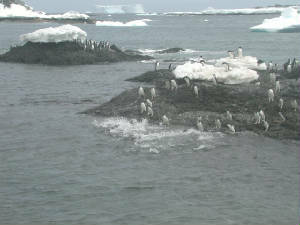 The penguins were so captivating that we hardly paid attention to a group of big, lazy Weddell seals napping on the ice.